As we said in the intro, the association between Buick and McLaren does not happen that often. In this case, we’re talking about the racing specialists McLaren Engines of Livonia, Michigan that were responsible for modifying Buick’s 3.8-liter V6. The exposed engine was upgraded to develop 360 horsepower (268 kilowatts) at 7,000 rpm and 398 pound-feet (540 newton-meters) of torque at 5,000 rpm. The engine was mounted in the middle, just behind the seats, and sent output to both axles with help from a four-speed automatic transmission which had a manual shifting option. There’s more to the concept than its McLaren-Buick engine. It also looks futuristic even today thanks to the canopy-styled roof which makes us think of Holden’s rather spectacular 1969 Hurricane concept. The curvaceous body was made from composite carbon fiber which enabled the concept to have an impressive low weight of 2,910 pounds (1,320 kilograms). Performances were not as great as you would expect given the hardware, with the 0-60 mph (0-96 kph) sprint taking 8.4 seconds while the top speed was electronically capped at just 70 mph (112 kph). To this day, details about the maximum speed of the unrestricted version are not known. The high-tech interior was a real gem, featuring a screen in the center console displaying info such as g-force, torque, oil pressure, and even a compass. The spoke-less steering wheel is also a sight to behold, as is the fancy head-up display showing the gear selection, mileage, and speed on the massive glass-made canopy. 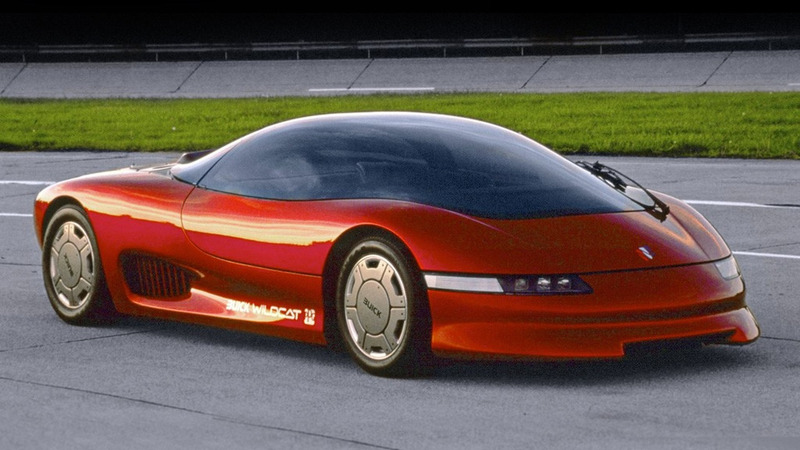 Although the concept displayed at SEMA was not functional, Buick built a second car which it actually used for a series of engineering tests, but the Wildcat did not make it as a production model. It followed three other namesake concepts (from 1953, 1954, 1955) and it was succeeded in 1997 by the Riviera Wildcat. Here's a quick reminder of our three most recent concepts from the series: Renault Espace F1, Toyota Celica Cruising Deck, and Chrysler Lamborghini Portofino.